MyNextMattress now has a wide range of furniture to offer. 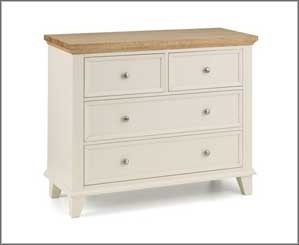 The following is our range of Chest of Drawers, and this selection is ever growing. We offer a choice of materials, sizes and even brands, including Bentley Designs, Julian Bowen and Birlea to name a few. All items are delivered free of charge, and all prices include VAT. Whilst we are primarily known for our work in providing top of the line products for our customers in the bed and mattress sectors, we have had the opportunity to branch out into different areas in recent years, which has given us the ability to take our experience and combine it with our passion for interior design. Chests of drawers are a classic furniture item that can be found in nearly every bedroom up and down the country. Despite the timeless appeal of chests of drawers, no two people have the same taste, which is why we stock different shades, colours, designs, sizes and styles to appeal to everyone's budget and personal taste.